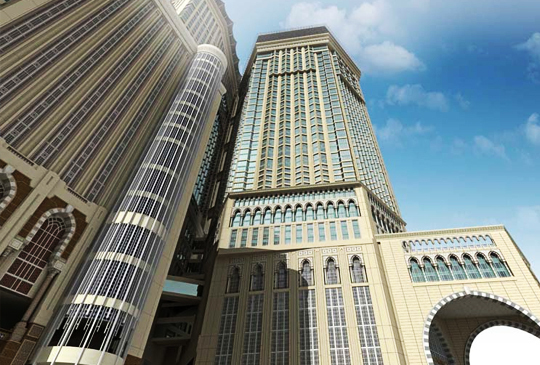 This sophisticated hotel is part of the iconic Abraj Al-Bait Towers, and has direct access to the complex’s shopping mall. The Sacred Mosque of Masjid al-Haram is a 4-minute walk, and Hira historic cave is 11 km.The polished rooms come with marble bathrooms, Wi-Fi (fee), tea and coffeemakers, minifridges and flat-screens, along with city and Masjid al-Haram views. Suites add separate living and dining areas. Room service is available 24/7.A free breakfast buffet is served in an upscale restaurant offering traditional Arabic and international dishes. There’s another warmly decorated eatery and a cozy tea lounge. Linked to a shopping mall, this modern business hotel is 1 km from Al-Masjid an-Nabawi and the Green Dome over the prophet Muhammad’s tomb. Featuring floor-to-ceiling windows, the bright rooms offer free Wi-Fi, flat-screen TVs, minifridges, and tea and coffeemaking facilities. Some have mosque views. The 3- and 4-bedroom suites have kitchens, maid’s quarters and lounge access; upgraded quarters include a Jacuzzi and/or private office. Breakfast and parking are free. Other amenities include 4 stylish restaurants that have bars and serve international, Asian and Middle Eastern cuisine. A business center and meeting rooms are available.